Embedded into the functionality of the viewport command is a list of standard viewport scales. These preconfigured scales allow a user to set the scale of a viewport in a matter of seconds. While the included scales save a lot of time for a fair number of the industry’s most common scales, it does not include every scale ever encountered. Likewise, there are likely a number of preconfigured scales that you never use. The SCALELISTEDIT command gives the user control over which scales are included in this list. Using the SCALELISTEDIT command the user has the ability to add, delete, modify, and even reorder the standard scales provided in this list. If you are constantly using architectural units, why have engineering listed. Likewise if you are in engineering, why have all of the architectural scales listed? Do note that the SCALELISTEDIT command is applied to AutoCAD as a program, and is not stored within the drawing. For this reason it is not possible to embed custom scales into drawing templates. Such functionality would of course be helpful for multi-discipline firms. If prefixed with a hyphen, the â€“SCALELISTEDIT command will display a command line only version of the command. This could prove helpful if one wanted to specify available scales using something such as a script or LISP â€“ loaded at startup. Design Review – Now FREE! @ LY – The easiest way to pull up the “Viewports” toolbar is to right-click on the toolbars and select “Viewports” from the resulting list. 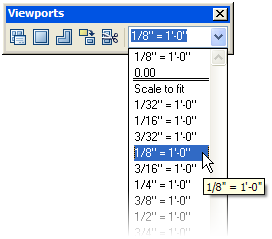 You can also see the list of viewport scales by selecting a pre-existing viewport from the Properties task pane. @ Chris C – I just did some research and found that you are indeed correct about AutoCAD 2008. Pre AutoCAD 2008 the SCALELISTEDIT command was stored in the registry. AutoCAD 2008 (and above) stores the values in the drawing. Seems the reason is related to the new Annotation Scaling feature. Are you sure that SCALELISTEDIT is still stored in the registry? I’ve read in AUGI Forums that this not the case for AC2008, with the introduction of the Annotation scale settings the SCALELISTEDIT is now stored in the DWG.